In our aim to discover Mallorca, from Gran Isla Hotels we want to talk about some details of our culture, so today we would like to present several museums all visitors must see. CCA Andratx: the Centre of Contemporary Art calls visitors and artists to explore art and nature. There are both exhibitions and works for sale. The expositions are varied: paintings, sculptures and photographies. It offers guided tours in Spanish, Danish, German and English. Entrance is free. 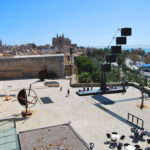 Es Baluard: it is the museum of contemporary art of Palma, located close to the Cathedral and facing the sea is one of the most popular attractions. It holds national and international artists exhibitions. Museum Chopin: it is placed in the beautiful village of Valldemossa. Chopin lived there while recuperating from illness and he composed some of his most famous works. His original piano is exhibited in one of the rooms. Yannick and Ben Jakober Foundation: gardens, sculptures and a children’s portraits collection is the perfect combination to have a an amusing morning in Alcudia. Entrance is free on Tuesdays. Ethnological Museum of Muro: a 17th century house which features popular objects from the beginnings of 20th century. Old regional costumes and pottery are exhibited in several rooms. Entrance is free. Probably, after all these cultural sights you have many pictures in your mobile or camera, so when coming back to your hotel you can share them with your family and friends thanks to Gran Isla Hotels free WiFi, this service is available in all our resorts. To know these places and much more of this island, visit Gran Isla Hotels’ official website and take advantage of the special discounts. We have the best online prices! And if you are planning 2007 holidays, rates are also available.